“Jazz from the Past, Early Las Vegas is Back with Lena Prima at Smith Center! Those dynamite rhythms, the explosive horn section’s solos and breathtaking mix of musical instruments when the musicians suddenly take off should not be missed! Lena Prima brought that wonderful feeling of early Las Vegas to Myron’s Cabaret Jazz at The Smith Center! I arrived in Las Vegas, in the 80’s, and heard his music played everywhere in the 80’s and 90’s while the excitement of enjoying Louis Prima still fills the showrooms to this day with his daughter Lena Prima’s band. The showroom brightened as Lena Prima’s band began playing their authentic versions of her father’s music. It’s the special sound of the swing bands, the Dixieland bands and Louis Prima’s famous hit songs that people loved so well and now is coming back to delighted audiences. The audience were thrilled as Lena sang each song and added some Italian numbers, Louis Prima’s hits, and even the comical “Please No Squeeza Da Banana.” Tina’s beautiful interpretations were spotless expressing her love. 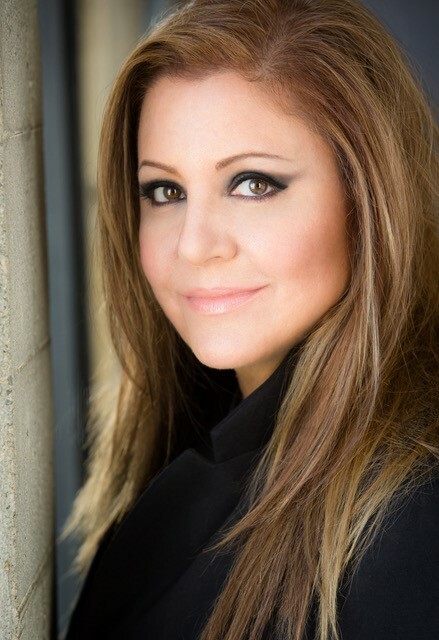 With five albums to her credit, award-winning singer, artist and author Lena Prima is the youngest daughter of the legendary Louis Prima and his singing sidekick, (and fifth wife) Gia Maione. Her more than 30 year musical career has included more than 3,000 appearances around the world. In New Orleans she can be found regularly performing at the Hotel Monteleone in the French Quarter. Lena’s touring schedule as well as photos and video of her performances can be found on her website www.lenaprima.com. A whole new era of music began, with Louis coining such expressions as “swing” and other “hep” sayings like “solid jack,” “crazy man,” and many more. Later, it was decided to name Benny Goodman the King of Swing, but only as a result of a big hit on the song “Sing Sing Sing,” written by Louis Prima. Louis Prima moved to New York City, establishing a big band and composing the iconic jazz song “Sing, Sing, Sing.” He later wed singer Keely Smith and the two had a highly popular Vegas Act billed as The Wildest, with Prima also having a number of hit recordings. Prima also starred in the animated Disney film The Jungle Book. Previous story Will Jesus Christ be next?